Although Hyrule Warrior sold much better than Nintendo anticipated, it isn’t the first game to be spawned from the Dynasty Warriors franchise. Its sister series, Samurai Warriros, has had numerous games released across multiple platforms since its first game back in 2004. 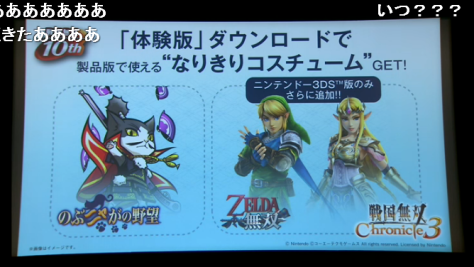 The latest entry, Samurai Warriors: Chronicles 3 for the 3DS, will be featuring costumes for Link and Zelda from Hyrule Warriors. Take the jumo for more info! I don’t know what the Japanese writing says and there hasn’t been a lot of information released so it’s unknown whether they will be available from the start, needing to be unlocked or DLC. It’s a shame they’re just a skins as it would be great to see Link’s and Zelda’s Hyrule Warriors abilities being used to help fight a war in feudal Japan. 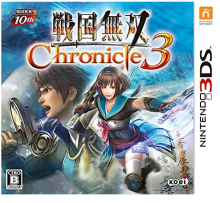 Samurai Warriors: Chronicles 3 is due for release in Japan on December 4th and, while no announcement has been made about the game being released elsewhere, the series has seen success in the past so there is still a chance it could happen sometime in the future. What characters skins would you like to see in other games? Tell us your thoughts in the comments below.